At-home monitoring device complements breakthroughs in the diagnosis and treatment of AMD. Eyes with neovascularization that is detected early and that receive prompt treatment with anti-VEGF therapy have a high probability of maintaining 20/40 or better vision. For patients, this means they can read, drive, and continue to function independently. Patients with dry AMD have no universal timeline for disease progression. Typically, patients are sent home with an Amsler grid and told to return in 6 months, or earlier if they notice any changes in their vision. Unfortunately, the Amsler grid is not a highly sensitive testing tool.5 Although some patients experience no change in disease progression over a 6-month period, others may develop changes in pathology that remain undetected and asymptomatic until their next appointment. By the time changes are detected, these eyes may already have significant, irreversible vision loss. The ForeseeHome device tests hyperacuity, or Vernier acuity, which is the ability to recognize differences in the spatial location of objects. During a test, users receive visual stimuli consisting of a series of dots, some of which are purposely misaligned, in various locations of the visual field; the patient’s task is to identify the location of the distortion. When the stimuli are projected onto an unhealthy part of the retina, the patient will perceive 2 or more distortions on the line, with 1 corresponding to the artificial wave and the other to the patient’s pathology. Owing to the preferential looking principle, patients will perceive the pathologic distortion more strongly if it is in fact larger than the artificial wave. The patient will then, in turn, mark the location of the perceived pathologic wave, thus giving clues as to the location and quantity of underlying pathology. The device has demonstrated an ability to detect changes in users’ visual perceptions often before the patient is aware of them visually. The Home Monitoring of the Eye (HOME) study was a substudy of the National Eye Institute (NEI)-supported AREDS2. The HOME study evaluated whether detecting neovascular AMD with the ForeseeHome PHP device improved patient outcomes compared with detection with standard care.7 For the study, 1520 AREDS category 3 and 4 dry AMD patients were enrolled at 44 clinical centers. All eyes had BCVA of 20/60 or better at baseline. Participants were given instructions to test their eyes several times each week with either the ForeseeHome device or using standard care home testing specific for each clinic. Often standard care involved Amsler grid testing. In the primary analysis of the study, frequent users of the ForeseeHome device showed a median loss of visual acuity of 3.0 ETDRS letters from baseline to neovascular AMD detection, compared with a median loss of 9.0 letters in the standard care cohort. In addition, 94% of patients using the Foresee device to detect conversion to wet AMD maintained 20/40 or better visual acuity at the time of wet AMD detection, compared with 62% of patients using other detection methods. When reviewing an interim analysis, conducted at approximately 80% of the planned sample study, the study’s independent data safety and monitoring committee noted such a significant difference between using the ForeseeHome device and standard care alone that it recommended the HOME study be terminated early for efficacy. I have been offering ForeseeHome testing to patients for several years and can confirm the study findings. All patients taking AREDS supplements are at high risk for vision loss and are excellent candidates for the Foresee device. I explain to them how the device works and the probability that this technology will best enable them to maintain functional vision so that they can stay independent, read, drive, and see their grandchildren. While there is a modest cost involved, patients generally find this investment in their visual future to be reasonable when compared with the cost of losing their functional sight. The ForeseeHome device includes telemonitoring that effectively combats poor compliance and dropout. Whenever a change in visual field is detected, the physician’s office is notified immediately so that the patient can be called in for a formal examination. Additionally, the physician is sent monthly reports showing exactly when and how often patients test their visual fields with the device. The manufacturer of ForeseeHome will contact the patient if too many days lapse between tests or if the test is being performed incorrectly. If the company is not successful at encouraging the patient to use the device, the practice is notified so that it can intervene. In my practice, when patients come in for their examinations, I review the ForeseeHome results to date with them. I show them a graph depicting their frequency of use and give encouragement when needed. Patients tend to think they are more compliant than they actually are. Showing them the actual data can provide great motivation for improvement. Other alternatives to the Amsler grid have been proposed for detecting neovascular AMD, but the ForeseeHome device is the only 1 that has been clinically proven to improve early wet AMD detection with level 1 evidence provided by a large randomized clinical trial. For me, the Foresee system is the equivalent of going into a patient’s home 3 or 4 times a week and examining him or her, without the invasiveness or the use of scarce resources. I have received alerts of changes in visual field for patients who were examined in my office as recently as 1 week previously (Figure). Amazingly, when we conducted the immediate follow-up, we found pathology that was not present at the previous appointment just a week prior. Their vision was still excellent and they were asymptomatic. We were able to begin treatment immediately and preserve these patients’ vision. There is still more to be done when it comes to understanding and treating AMD, but the early detection provided by the Foresee device is a breakthrough in AMD treatment. The safety net afforded by the Foresee system closes the loop with recent diagnostic and therapeutic advances in treating wet AMD, allowing patients to achieve the best possible visual results through earlier detection of wet AMD. Michael J. Elman, MD, is an assistant professor of ophthalmology at the Johns Hopkins University School of Medicine; the director of retina surgery at Franklin Square Hospital; and the founder of the Elman Retina Group, all in Baltimore, Maryland. He is a consultant to Genentech/ Roche and Ohr Pharmaceuticals; a speaker for Scienomics; has equity interest in Ohr Pharmaceuticals; and receives research support from Genentech/Roche, Jaeb Center, Merck, National Eye Institute, and XCovery Laboratories. Dr. Elman may be reached at elman@elmanretina.com. Age-Related Eye Disease Study 2 Research Group. 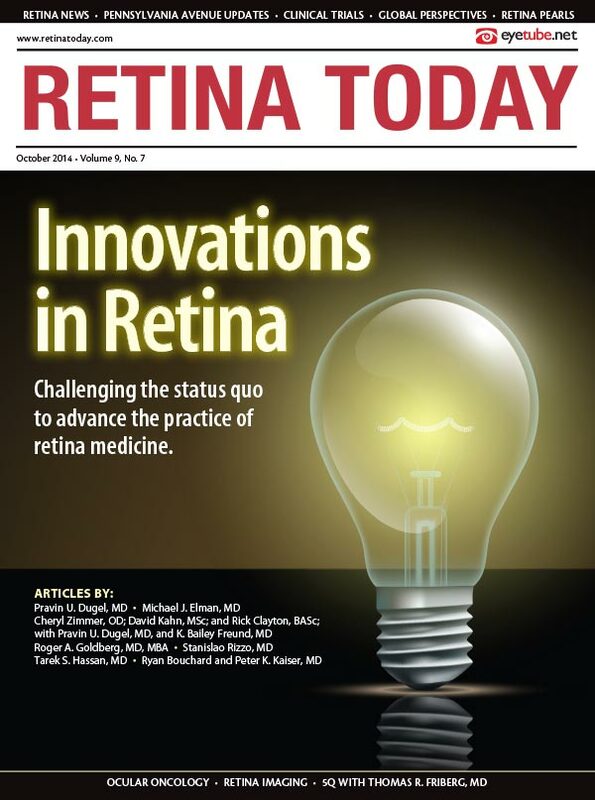 Lutein + zeaxanthin and omega-3 fatty acids for agerelated macular degeneration: the Age-Related Eye Disease Study 2 (AREDS2) randomized clinical trial. JAMA. 2013;309(19):2005-2015. Sloan FA, Hanrahan BW. The effects of technological advances on outcomes for elderly persons with exudative age-related macular degeneration. JAMA Ophthalmol. 2014;132(4):456-463. Ying GS, Huang J, Maguire MG, et al. Baseline predictors for one-year visual outcomes with ranibizumab or bevacizumab for neovascular age-related macular degeneration. Ophthalmology. 2012;120(1):122-129. Schuchard RA. Validity and interpretation of Amsler grid reports. Arch Ophthalmol. 1993;111(6):776-780. Loewenstein A, Ferencz JR, Lang Y, et al. Toward earlier detection of choroidal neovascularization secondary to age-related macular degeneration: multicenter evaluation of a preferential hyperacuity perimeter designed as a home device. Retina. 2010;30(7):1058-1064. AREDS2-Home Study Research Group. Randomized Trial of a Home Monitoring System for Early Detection of choroidal neovascularization home monitoring of the eye (HOME) study. Ophthalmology. 2014;121(2):535-544.